Khalil Ibrahim graduated from the prestigious St. Martin’s School of Art & Design, United Kingdom in 1964. Thereafter, he became a full-time artist and has been so for fifty years now. He has held solo and group exhibitions in Malaysia, Singapore, Indonesia and Switzerland, with most of his works centre around figures and are heavily in influenced by East Coast fishermen and women. As a medium, batik in Malaysia opened itself out in various directions by the mid-twentieth century. While contemporary batik painting in its extended form became not just a continuation of the craft’s classical origins but rather it took a revolutionary step forward as an accepted notion of mark making within Malaysian contemporary art practice. While the late Chuah Thean Teng pioneered this art form in the 1930s, it was only accepted as a medium of artistic expression by the 1960s. Somewhat later, Khalil Ibrahim also depicted Malay life, primarily that of the fishermen fraternity, through the batik technique – in a more real sense. While colour and texture became the primary fascination for Khalil, he remained true to – firstly, the human figure albeit fragmented and secondly his people of the East Coast. Unlike Teng’s subjects who reflected a lazy contentment about kampung life, Khalil’s interpretation, in a piece such as East Coast (1978) NAG seems somewhat more involved. Even if rather romanticised in gesture and cluster and vibrant colour, there are possessed in their stance – notions that highlight their industriousness. 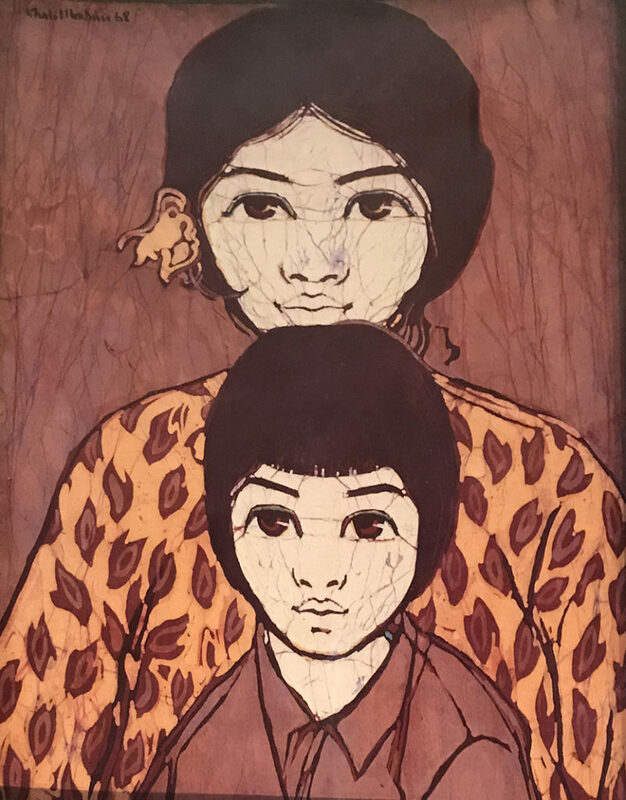 Despite his formal western art education, Khalil never wavered from his rich Kelantanese cultural heritage and it was natural that he would pursue batik painting upon his return from England in 1966. For Khalil, the material and tools of batik making were no different from the pens and paints used in artwork. It is undeniable that Khalil’s understanding of batik was deeply rooted. The manufacture of batik has notably been associated with the East Coast states of Kelantan and Terengganu, having been introduced into Kelantan by Indonesian craftsmen in the very early twentieth century. Renowned for his pictorial style and his fascination with the daily activities of the rural communities of the East Coast, he employed various techniques that included traditional methods such as dip dye, crackling and the use of the tjanting to imbue delicate lines and details to his paintings. In his abstract batik paintings, he developed techniques by using brush strokes and thus created abstract works that broke through tradition and defied the stereotypes of batik painting.